As the Interstate 11 project inches closer to groundbreaking, Boulder City is trying to draw more people in by changing an important street name in town. Boulder City Chamber of Commerce CEO Jill Rowland-Lagan said the city hopes to get the name change approved for the U.S. Highway 93 Business Route, also known as Nevada Highway. The change would incorporate “Boulder City” into the name with the intent of boosting local businesses along the busy strip. 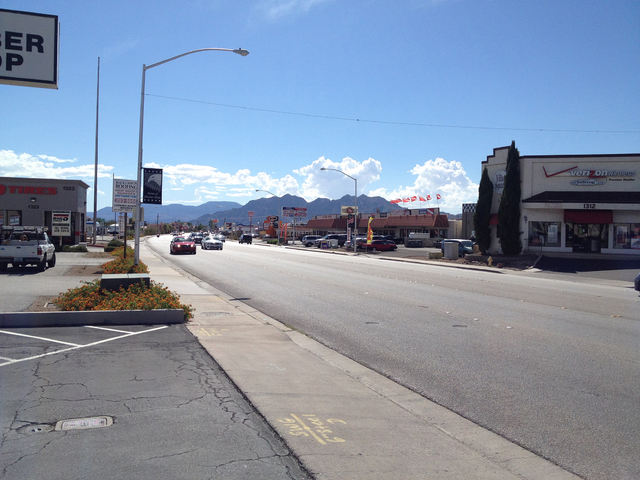 Boulder City Boulevard and Boulder City Parkway are the two options the city is exploring. “We need to get the name Boulder City up there,” Rowland-Lagan said. Rowland-Lagan said it’s important to have Boulder City as part of the name, especially since the Boulder City bypass is scheduled to be completed by 2017. “Would you know that you needed to get off on Business 93 if you just happened to be driving through town?” she told a group of business owners during a July meeting to discuss advertising for I-11. “If it said Boulder City Parkway or Boulder City Boulevard, it would make a lot more sense,” she added. Dee Steinman, who works at Erick Begay Native American Jewelry, said it would be more beneficial if the city incorporated “Hoover Dam” into the new name as opposed to Boulder City. Many of her customers are either headed to or coming back from Hoover Dam, she said. As a business that also travels across the country, Steinman said some of the customers she talks to think it’s from Boulder, Colo., instead of Boulder City in Nevada. Steinman said she didn’t know if renaming the U.S. 93 Business Route to Boulder City Parkway would have an effect on local businesses along the road, but said she could see a drawback from an ownership aspect since local business owners would have to create new business cards and brochures. Still, she thinks the name Hoover Dam would have a longer-lasting effect. “It’s on the map. They like it, they want to go see it because they know about Hoover Dam,” she said. Jill Quatrale, owner of Chilly Jilly’z, said it’ll be an inconvenience having to remake business cards and brochures, but still views the potential name change as a plus. As for the effect the name change could have on local businesses, Quatrale remains indifferent. The Boulder City Council will decide on the name change at Tuesday’s meeting. If approved, the city would send an application to the Nevada Transportation Department. The department said Wednesday that the name would officially remain the same, but the local designation of the road would change. The change would likely go into effect in about a year, Rowland-Lagan said. City Manager Dave Fraser said the new name would be on five signs for drivers coming into Boulder City from Las Vegas and two signs coming from Arizona. At the Sept. 9 council meeting, changing names of two other roads will be discussed, he said.